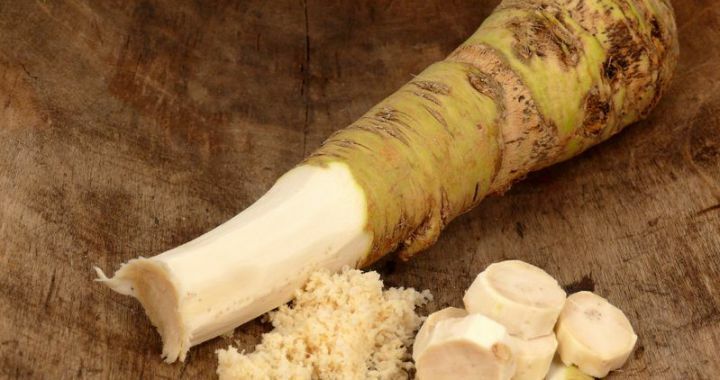 The pungent horseradish sauce that delivers a kick to salads, sauces, mustard and even mayonnaise, is made from the grated raw root. The ground root also has many healing actions; as a mild antibiotic, expectorant and diuretic that promotes perspiration making it useful for breaking fevers, especially those associated with colds and flu. In other words, it is a good winter herb. Horseradish is a fairly substantial deciduous perennial with a 1metre spread and garden height of 40cm. It requires full sun and well drained soil. Before planting prepare the soil to a depth of at least 30cm and add lots of compost to the top soil so that the soil is friable and drains easily. It is a good companion plant for potatoes, and plum trees and an infusion of the root can be used as an anti-fungal spray for fruit trees and as a repellent for cucumber and potato beetles. The main harvest of the roots is in autumn, although fresh roots can be lifted at any time during the year when needed. Digging up the entire plant and pruning the roots as well as the top growth, prevents the plant from spreading and becoming invasive. New growth will sprout in spring and the very young leaves can be added to salads or cooked like spinach. Posted in Culinary, Healing Herbs, Insect Repelling and tagged companion, culinary use, health benefits, repellant.